The Spring collection includes Apple Watch bands for every occasion. Apple debuts a Spring collection of bands with vibrant colors and unique designs. 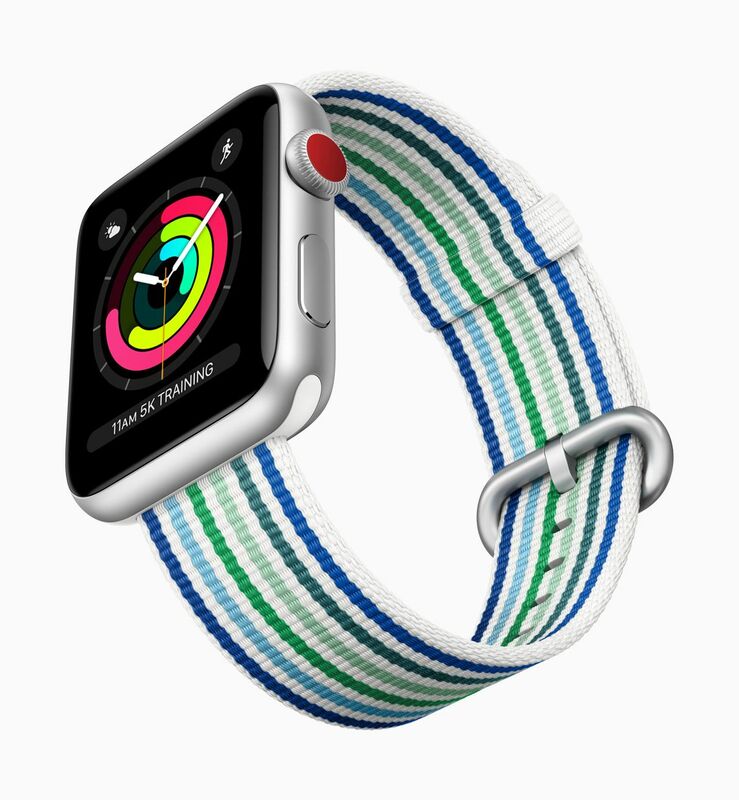 This season’s updates include Woven Nylon bands with a fresh stripe that alternates white with color for a crisp, clean look, exclusive Nike bands that color-match with the latest Nike running shoes and a striking new edge paint color for Apple Watch Hermès bands. Later this month, all new bands will be available to order from apple.com and for purchase at select Apple Stores, Apple Authorized Resellers and carriers. The Woven Nylon bands now include an updated stripe pattern. Apple Watch Series 3 (GPS + Cellular) will include new 38mm and 42mm Space Gray Aluminum Case with Black Sport Loop models. The Nike Sport Loop can be easily adjusted for the perfect fit. Apple Watch Nike+ (GPS + Cellular) will include new 38mm and 42mm Space Gray Aluminum Case with Midnight Fog Nike Sport Loop models. 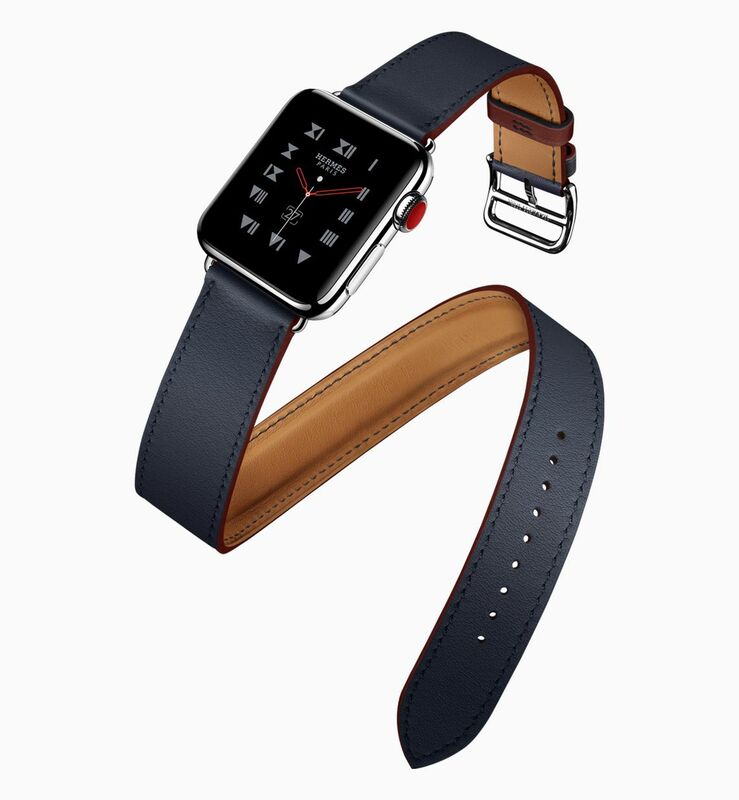 This season’s Apple Watch Hermès bands feature an accent color. Apple Watch is available in two different case sizes, 38mm and 42mm. Apple Watch Series 1 will be available in silver or space gray aluminum cases paired with a Sport Band and starts at just $249 (US). Apple Watch Series 3 (GPS) will be available in gold, silver or space gray aluminum cases with a Sport Band starting at $329 (US). Apple Watch Series 3 (GPS + Cellular) will be available in gold, silver or space gray aluminum, or silver or space black stainless steel paired with a variety of bands starting at $399 (US); and Apple Watch Edition in gray or white ceramic starts at $1299 (US) from apple.com, Apple Stores and select Apple Authorized Resellers and carriers. For local availability, visit locate.apple.com. Apple Watch Nike+ starts at $329 (US) and Apple Watch Hermès starts at $1149 (US). New Apple Watch models will be available to order on apple.com later this month in Australia, Canada, China, France, Germany, Hong Kong, Japan, Singapore, Switzerland, the UK and the US. Apple Watch bands will be available to order on apple.com later this month in Australia, Austria, Belgium, Brazil, Canada, Czech Republic, China, Denmark, Finland, France, Germany, Hong Kong, Hungary, Ireland, Italy, Japan, Luxembourg, Malaysia, Mexico, Netherlands, New Zealand, Norway, Philippines, Poland, Portugal, Puerto Rico, Russia, Singapore, South Korea, Spain, Sweden, Switzerland, Taiwan, Thailand, Turkey, UAE, the UK and the US. The Sport, Sport Loop and Woven Nylon bands are $49 (US) and the Classic Buckle is $149 (US). New Apple Watch Nike+ models will be available to order on apple.com and nike.comlater this month in Australia, Canada, China, France, Germany, Hong Kong, Japan, Singapore, Switzerland, the UK and the US. 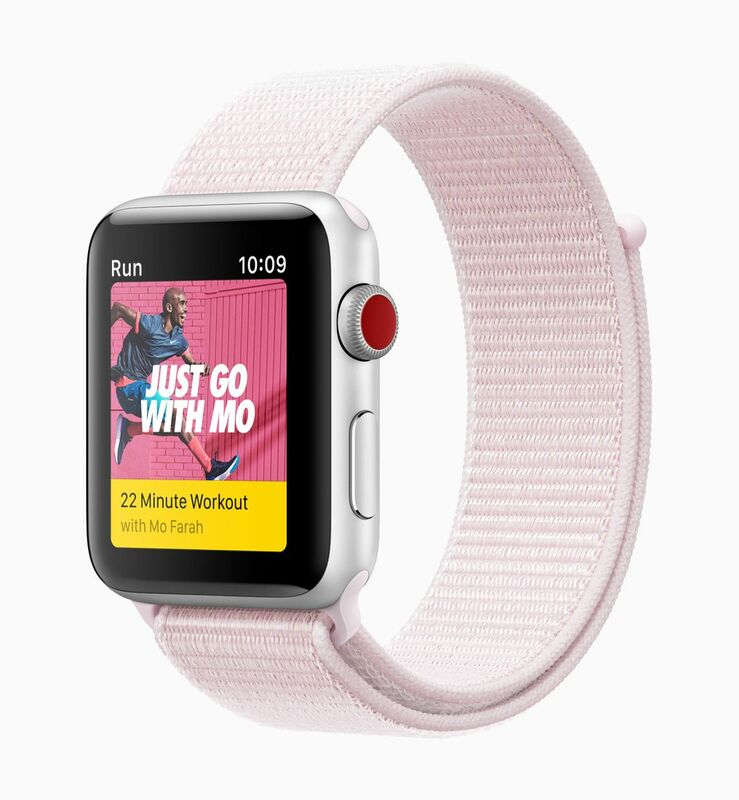 New Nike Sport Bands and Sport Loops will be available to order on apple.com and nike.com later this month in Australia, Austria, Belgium, Brazil, Canada, Czech Republic, China, Denmark, Finland, France, Germany, Hong Kong, Hungary, Ireland, Italy, Japan, Luxembourg, Malaysia, Mexico, Netherlands, New Zealand, Norway, Philippines, Poland, Portugal, Puerto Rico, Russia, Singapore, South Korea, Spain, Sweden, Switzerland, Taiwan, Thailand, Turkey, UAE, the UK and the US. The Nike Sport Band and the Sport Loop are $49 (US). New Apple Watch Hermès bands will be available to order on apple.com and Hermes.com later this month in Australia, Belgium, Canada, China, France, Germany, Hong Kong, Italy, Japan, Mexico, Russia, Singapore, South Korea, Spain, Switzerland, Taiwan, Turkey, UAE, the UK and the US. The Single Tour Rallye is $439 (US) and the Double Tour is $489 (US). New Apple Watch, Apple Watch Nike+ and Apple Watch Hermès bands will be available at Apple Galaxy Macau later this month. Apple Watch Series 3 (GPS + Cellular) requires an iPhone 6 or later with iOS 11 or later. Apple Watch Series 3 (GPS) requires an iPhone 5s or later with iOS 11 or later. Apple Watch Series 1 requires an iPhone 5s or later with iOS 11 or later. Some features are not available in all regions or all languages. Customers who buy Apple Watch from Apple will be offered free Personal Setup, in-store or online,1 to help set up and personalize their new Apple Watch with calendars, notifications, apps and more. Anyone who wants to learn the basics or go further with their new Apple Watch can sign up for free sessions at apple.com/today. 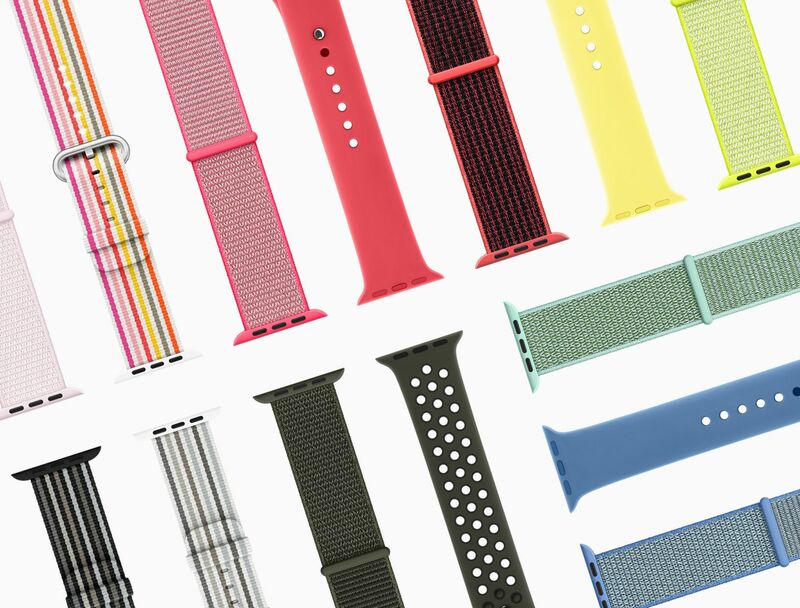 Even if the weather isn’t cooperating, Apple is ready for spring with a new slate of Watch bands in bright new colors and designs to chase away the winter blues. Some two dozen new bands will be available later this month either as part of a new Apple Watch purchase or as an add-on accessory. Apple hasn’t said whether any colors will be retired as a result of the new models, but several of the new colors seem to be variations on ones that are already available. For example, there’s a new Lemonade Sport Band, which looks very much like the current Flash model. All said, there will be 22 new sport, woven nylon, classic buckle, and loop bands that will join the hundreds of band-case combinations that are already available, as well as standalone availability of the Nike Sport Loop and four new Hermes models that now display contrasting accent details.